And that all reap what all have sown. When I first went on a Sister Parish delegation from St. Joan of Arc Church in Minneapolis, I didn’t realize I was starting the long journey to ‘build community’ across borders. My motivations were simple — to see a part of the world unfamiliar to me and to learn about Guatemala’s culture, history and people. Little did I know that, through my experiences and the people I met there, I was planting seeds that would eventually blossom into a much deeper interconnectedness with our community of friends in Guatemala. Nancy with members of Tierra Nueva 2 and SP Executive Director Carrie Stengel. 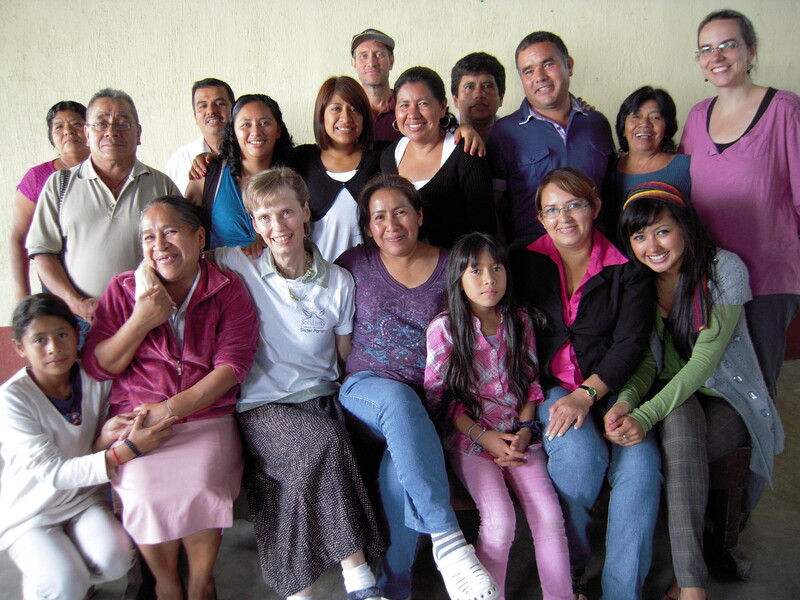 Fast forward to April 2013 when I traveled on my third delegation, this one to Guatemala and El Salvador. Unlike previous delegations, our group of travelers came from diverse places — the U.S. (from California to Maine), Scotland, Guatemala and El Salvador. Our intent was to celebrate the 25th anniversary of Sister Parish, build relationships and make plans with Sister Parish Southern Directiva members, and visit various Sister Parish communities in both countries. We made friends. Between 40 and 50 people from the United States, Guatemala and El Salvador, all involved in Sister Parish, came together in El Salvador for the Southern Directiva meeting. During the weekend, we exchanged greetings,we learned their stories and we told them ours. Later, we had the chance to visit three long-standing Sister Parish communities, UPAVIM and Tierra Nueva 1 and 2, where we were warmly welcomed. We sang songs. Oh the power of song! Ours was a musical group (no thanks to me) and everyone gathered when the banjo came out of its case. Language was no barrier and we sang in Spanish, English, French and Chinese. Whether our mood was joyful or sad or prayerful, we came together in song. We enjoyed food together. We ate mangoes right from the trees at our San Salvador hostel. Pupusas stuffed with queso and frijoles were a popular meal and several of us took pupusa-making lessons. Rick, my husband and fellow delegate, has already demonstrated his pupusa-making skills here in Minnesota. Chocobananos are next in line! We shared spiritually. We prayed together. We worshiped on Sundays in the communities of Guarjila and Tierra Nueva 2. Otto, a Mayan spiritual guide, shared aspects of Mayan spirituality and ceremonies with our delegation and we prayed for loved ones who are deceased. 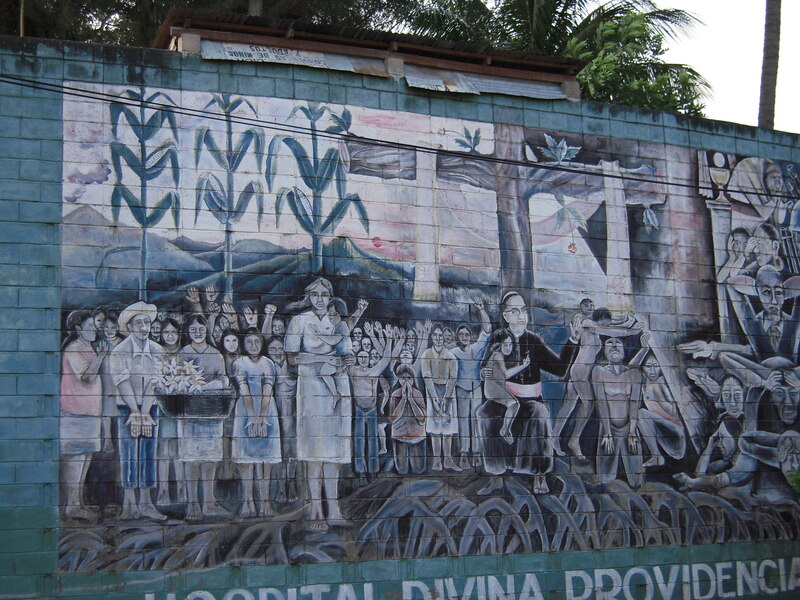 A mural of Archbishop Romero outside the chapel where he was murdered. We examined the lessons of the past. We learned about the harsh history of El Salvador and Guatemala (and U.S. involvement) through discussions with community activists and rights workers. In San Salvador we stood at the altar in the chapel where Archbishop Oscar Romero, a friend and protector of the oppressed, was assassinated in 1980. We visited the site at Universidad CentroAmericana (UCA) where six Jesuit priests, their housekeeper and her daughter were murdered by the military in 1989. We traced the thread from those dark days to the impunity, crime and social injustices that cause suffering and divisiveness today. We planned for our future. When we met with the Southern Directiva of Sister Parish, we divided up in groups to conduct a SWOT analysis (strengths, weaknesses, opportunities and threats) of the organization. The Northern and Southern Board members dined together and discussed ways to strengthen our relationship. We did a visioning exercise to identify ways to move our organization forward into the next 25 years. We stood together in solidarity. We attended the international premiere of the movie Gold Fever at the Teatro Nacional in Guatemala City. It told the story of the destructive impact of gold mining by a Canadian corporation in the highlands community of San Miguel Ixtahuacan. At the end, the packed house of 2000+ people rose in a standing ovation. The next day we ate breakfast with the film’s producer and learned more about the community’s reaction to the film. Then we went to the courthouse to attend a portion of the historic trial of former de facto president Efraín Ríos Montt, who is accused of committing crimes against humanity in the Ixil region during Guatemala’s civil war. After decades of impunity, this trial gives people hope for justice and change. Afterwards we spilled out into the plaza and streets to rally with hundreds of people witnessing this historic event. The people who make up the Sister Parish family are loving, hopeful, strong and committed. Together we are building global relationships of solidarity and friendship — person by person, story by story, seed by seed – with the promise of making the world a more interconnected and peaceful place. This entry was posted in 25th Anniversary, 25th Anniversary Delegation, Delegations, El Salvador, Guatemala and tagged 25th anniversary, 25th anniversary delegation, board member reflections, delegate reflections, st joan of arc. Bookmark the permalink. This was very informative. Thanks Nancy.